There is a moment in the television show “Community” where a white girl says, “I can excuse racism but I draw the line at animal cruelty.” It’s one of the most succinct jabs at the tendency and ability of privileged white folks to dismiss the pain and oppression of their fellow human beings in favor of appearing “progressive” in other ways. And I couldn’t stop thinking about that quote as I was watching Kristiana Rae Colón’s “Tilikum” — the world premiere currently running at Sideshow Theatre Company. At first glance, “Tilikum” is a theatrical adaptation of the controversial 2013 documentary “Blackfish” which investigates the captivity of an orca named Tilikum owned by Seaworld who was connected to three human deaths. But it would be negligent, ignorant, and an intentional misrepresentation of the play to leave the summary at that. 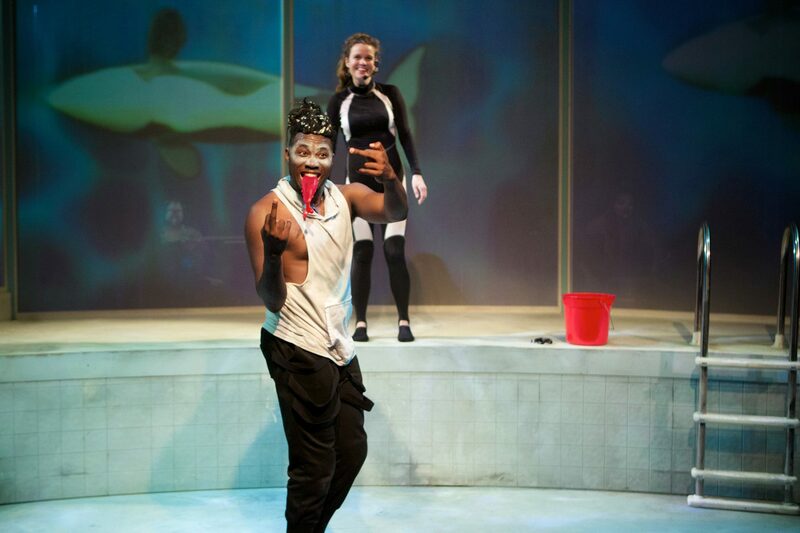 “Tilikum” is unabashedly about the incarceration of black folks in America. We are with Tilikum through his capture, training, and to the violence that gained him the attention of animal rights and protection agencies and documentary film makers alike. Apart from the other captive whales, his only interactions are with his trainer Dawn (Sigrid Sutter) and her abusive, misogynistic, triggeringly familiar boss known only as The Owner (Matt Fletcher). Though Dawn is sympathetic to Tilikum’s plight, any attempts she makes to improve his situation backfire, and none of her efforts can absolve her from the complicity of participating in the system that entrapped him in the first place. As with most of Colón’s work, “Tilikum” is more poem than play–each word carefully chosen not just for meaning but for sound, rhythm, impact and emotional power; each moment built to wash over you as a wave of lyricism. It takes a remarkable actor to manifest Colón’s vision, and Gregory Geffrard is nothing short of virtuosic in the title role. The entire play is beautiful, but Geffrard’s performance alone would be well worth the cost of admission. Tilikum is visually stunning from top to bottom, set upon a stunning scenic design by William Bowls and framed by a gorgeous projection design courtesy of Paul Deziel.. Director Lili-Anne Brown has brought us yet another do-not-miss production. In October of 2011, a year after the most infamous death tied to Tilikum, PETA filed a lawsuit against Seaworld as the orca’s “next friends”, (this is similar to next of kin) asserting that he had the right to freedom as outlined in the 13th Amendment of The Constitution of The United States of America. It was dismissed after three days of hearings as the 13th Amendment does not protect non-human species. Two years later, “Blackfish” aired to $2.5 million at the Box Office and widely spread critical acclaim. Seaworld suffered a $15.9 million loss that year, partly due to the films popularity and message. Celebrities and airline sponsors cut ties with the corporation, legislation was proposed (and some passed) by Senators and Representatives across the nation to protect orca welfare in captivity. The world shifted. Audiences and folks who live with privilege made their priorities clear. Meanwhile, black folks are incarcerated at more than five times the rate of white folks. The imprisonment rate of black women is twice that of white women, and though black and hispanic folks make up 32% of the U.S. population, they constitute 56% of the incarcerated U.S. population. The 13th Amendment supposedly protects people from slavery, but leaves a loophole which allows slavery as a punishment, so often modern prisoners are forced into unpaid labor. There have been many lawsuits, many documentaries. And none of them have resulted in the kind of call for change that privileged white folks have made on behalf of orcas. If only they cared as much about human beings as they do aboutwhales. Photos by Jonathan L. Green.